Raleigh is not only the capital of North Carolina, it is also filled with numerous activities for visitors of all ages. Whether you are in Raleigh on business or to explore the various museums and other attractions, you will find a range of hotels to choose from. 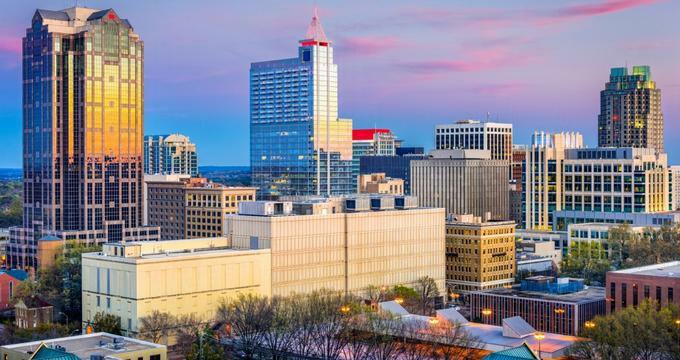 All of the major hotel chains have branches in Raleigh, letting you stay in familiar accommodations that are budget-friendly, luxurious, or something in between. 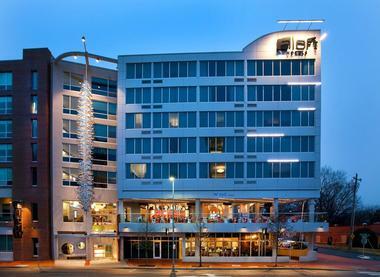 Sitting in the vibrant neighborhood of North Hills, the Hyatt House Raleigh North Hills is conveniently located by shopping, entertainment, and dining. There are 137 rooms to choose from, including suites with separate living rooms complete with sleeper sofas plus full-sized kitchens with microwaves, stove tops, and fridges. Residences have one or two bedrooms with a king bed each and one or two bathrooms. Studio guest rooms have minifridges, microwaves, and work spaces plus king beds and Cozy Corner sleeper sofas. Guests are welcome to use the fitness center to get in a workout while on vacation or can use the facilities of the business center. There is a seasonal outdoor pool plus a fire pit, and the property features free wireless internet, a 24-hour guest market, and a pool table. Since the property is geared towards longer stays, there is also a coin-operated laundry on-site plus a borrows program with essentials. Even with your own kitchen in your room, guests are treated to a free breakfast each day with chef-inspired omelets, Greek yogurt parfaits, all-natural sausage and bacon, steel-cut oatmeal, and other items. Dinner or drinks are available at the onsite H BAR. This is the newest of the Hilton brand hotels within the area and is close to downtown, the highway, and the airport, so guests have easy access to everything. The spacious guest rooms have Mirra Chairs by Herman Miller, minifridges, microwaves, ergonomic work desks, 47-inch flat-screen TVs with more than3 3 HD channels, and complimentary wireless internet. Rooms have two queen beds or one king bed along with Keurig coffee and tea makers, irons, alarm clocks, lighted vanities in the private bathrooms, and desk-level electrical outlets. Upgrade to a suite for panoramic views, wet bars, living rooms with a fireplace, an eight-seat dining table, and a powder room plus spa tub. Guests are welcome to use the fitness center 24 hours a day or swim at the indoor freshwater pool. You can also borrow a Stay Fit Kit to exercise in the privacy of your guest room. The business center is open 24 hours a day and offers remote printing. Other hotel amenities include a coin laundry, complimentary beverage area, ATM, lounge, luggage holding, and safety deposit box. Get a meal or drink at the Garden Grille & Bar and enjoy American dishes for breakfast or dinner. If you run out of anything, the Pavilion Pantry is also open 24/7. 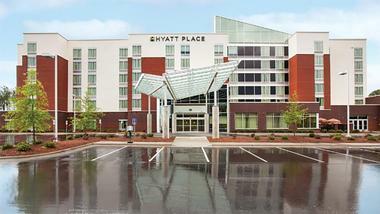 Hyatt Place Raleigh West spans six stories and has 132 rooms plus an LEED certification. 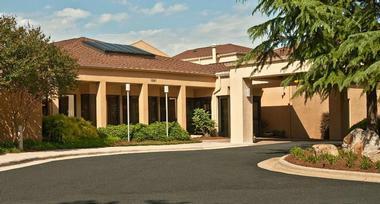 The hotel is pet-friendly for a reasonable fee and there is wireless internet throughout the property. All rooms have granite countertops in the bathrooms, complimentary toiletries, Hyatt Grand Beds, state-of-the-art work and media centers, Cozy Corner sofas or sleeper sofas, and 42-inch HDTVs. Other in-room amenities include hair dryers, dry bars, cordless speakerphones and voicemail, minifridges, AM/FM/MP3 clock radios, and single serve tea/coffee makers. If you forget something, you can buy or borrow it from Odds & Ends. There is a two-story gallery area with relaxing music, pleasing décor, and aromatic scents. Get in a workout at the 24-hour Stay Fit fitness center, which is complimentary for guest use, or swim in the pool. The day begins with free breakfast that includes cage-free eggs, Greek yogurt, all-natural bacon, and more. When you need a prepared salad or sandwich or hot baked item, visit the “Grab in Go” counter, where you will also find Starbucks prepared to order. You can also buy distilled beverages, beer, and wine at the Bakery Café, or grab something from the 24/7 Gallery Market. 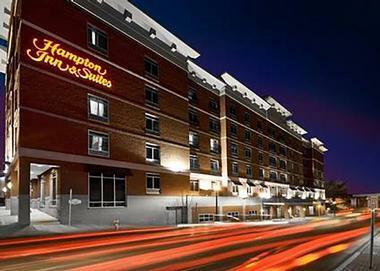 With a convenient location downtown, Hampton Inn & Suites Raleigh Downtown is in the Glenwood South District with its nightlife and restaurants. Each of the 126 rooms has an ergonomic chair and work desk, a 32-inch HDTV, and free wireless internet. Other standard amenities include coffeemakers, irons and ironing boards, free movie channels, free local calls, and free weekday copies of USA Today. Opt for a studio suite to also get a sleeper sofa, refrigerator, and microwave in addition to a more spacious work area. Go for a swim in the hotel’s indoor heated pool or get your workout in at the fitness center. The property also has a gift shop, convenience store, safety deposit box, snack shop, and baggage storage. Every morning, guests are treated to a free hot breakfast. On weekdays, you can opt for a Hampton On the Run Breakfast Bag instead if you are in a hurry. Hot coffee and tea are always available in the lobby. 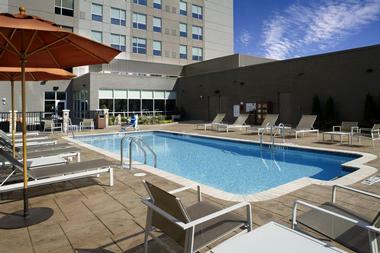 The Hyatt Place North Raleigh-Midtown is family-friendly and just a few miles from downtown in the trendy Midtown area. 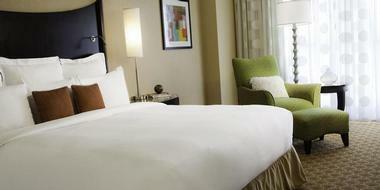 The rooms have Hyatt Grand Beds plus state-of-the art centers for media and work. The Cozy Corner sofas and sleeper sofas are comfortable, and the 42-inch HDTVs provide entertainment. Other amenities include KenetMD skin and hair care amenities, cordless speakerphones with voicemail, minifridges, remote printing, irons and ironing boards, hair dryers, wet bars, and coffee/tea makers. You can bring along your dog as this hotel is pet-friendly. If you forget something, contact Odds & Ends to borrow it, get it for free, or buy it. The property has free wireless internet, a 24/7 fitness center to get in your workout, and remote printing. Head to the Coffee to Cocktails bar for an alcoholic beverage at night or your favorite coffee drink in the morning. The Gallery Menu is offered fresh 24/7 with a range of delicious options like flatbreads and tacos. The daily free breakfast features fresh fruit, Greek yogurt, all-natural bacon, cage-free eggs, and more. You can also get a quick meal from the Grab ‘n Go case with greens, sandwiches, and bottled beverages. 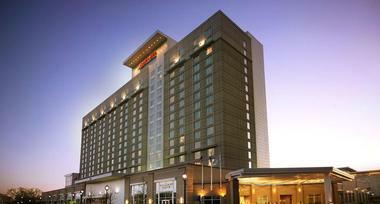 The Raleigh Marriott City Center is downtown and connected with the Raleigh Convention Center for easier access. 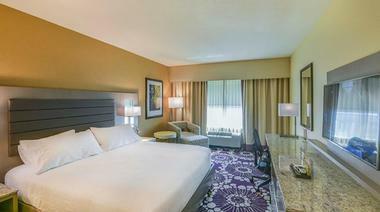 The rooms feature high-speed wireless internet plus flat-panel TVs complete with premium channels. The plush beds are filled with fluffy pillows and cotton-rich linens. Standard amenities include your choice of one king bed or two double beds, a hair dryer in the marble bathrooms, an oversized chair, an alarm clock, a moveable desk with ergonomic chair and outlets, an iron with ironing board, and an outlet featuring dual voltage adapters. There is also a coffeemaker, a 37-inch plasma TV with premium movie channels, satellite, and cable, plus an iPod dock and radio. Executive rooms add a sofa bed. Swim in the indoor pool that has gorgeous scenic views or visit the fitness center, where you will find all the well-maintained equipment you need. Rooms on the concierge level get access to an exclusive lounge. Get a meal at the Rye Bar and Southern Kitchen, where you will find Southern dishes and an extensive drink menu. You can get your favorite coffee beverage at the on-site Starbucks. Room service is available, so you can enjoy a meal without leaving your accommodations. Aloft Raleigh is just across from the Bell Tower of North Carolina State University and close to Research Triangle Park and the airport. The property has fast and free wireless internet and is pet-friendly. There are multiple room types, all of which have your choice of two queen or one king bed, free bottled water, a coffeemaker, a minifridge, an ergonomic workstation, Bliss spa amenities, and a 49-inch TV. You can opt for a more spacious room or one with a separate living room. Work up a sweat at the Re:charge gym or go for a dip in the splash pool. When the weather is nice, sit on the outdoor terrace on the second floor. SPG Keyless means you can use the application to unlock your room. At the end of the day, get a cocktail, wine, or beer at the W XYZ bar or play pool at Re:mix lounge. The bar also features occasional live music. Find grab and go food choices at the Re:fuel by Aloft, which is open 24/7. The Courtyard Raleigh Midtown gives guests easy access to local attractions like the North Carolina Museum of Art and North Carolina State University. The rooms feature complimentary Wi-Fi and ergonomic workstations to help you be productive. Rooms also have minifridges and microwaves so you can store and reheat leftovers. Choose from a room with two queen beds or one king, and enjoy other amenities like a sofa bed, hair dryer, shower/tub combination, alarm clock, iron with ironing board, coffeemaker, radio, and 37-inch LCD TV with cable/satellite channels, HBO, and premium movie channels. Some rooms also have private balcony access or separate living rooms plus floor-to-ceiling windows. Stay fit with the fitness center, where you will find free weights and cardio equipment, or go swim some laps in the outdoor pool. Start your morning with a Starbucks beverage and meal at the Bistro, the on-site restaurant serving American cuisine. 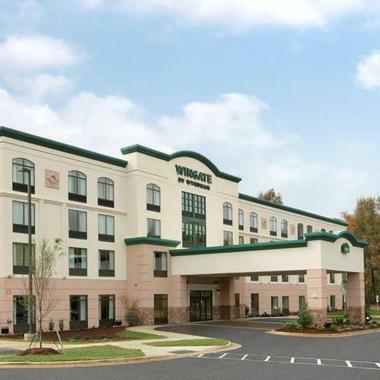 The Wingate by Wyndham State Arena Raleigh/Cary is brand new and offers modern lodging in a convenient location. All rooms have fridges and microwaves to help you store and reheat any food you have on hand. You will also get ergonomic chairs at the large work desks, high-definition TVs, weekday newspaper deliver, blackout drapes/curtains, a coffee/tea maker, Neutrogena toiletries, free local calls on the cordless phone, an iron with ironing board, voicemail, individual air conditioning, hair dryers, a lounge chair with ottoman, and in-room safes that can hold a laptop. Choose from two queen beds or one king or opt for a room with a king bed and sleeper sofa. Relax at the end of the day in the whirlpool or just enjoy the indoor swimming pool. Consider visiting the on-site fitness facility with Precor equipment. The entire property has complimentary high-speed Internet. The business center features a computer station plus free printing and copying. All guests receive a complimentary breakfast in the morning.